KIEV, Ukraine -- US President Barrack Obama dare not utter the word ‘invasion’ and asks his advisers why Ukraine is so important. Russia denies it has troops in eastern Ukraine while Ukraine itself describes its own military actions there as an “anti-terrorist operation”. In reality, Europe is witnessing a war that is producing casualties for the Russian army on a scale not seen since the Soviet invasion of Afghanistan. It is time to recognise it as such. Russian NGO activist Elena Vasilieva described this week how she set up a Facebook page Cargo 200 from Ukraine to Russia – a reference to the Soviet/Russian euphemism for transport of dead soldiers. Based on information from families across Russia she calculates that 4,000 Russian soldiers have been killed so far in Ukraine. Vasilieva’s estimates have been backed by other Russian NGOs such as the Committee of Soldiers’ Mothers and Inform Napalm. Vasilieva herself launched the Forgotten Regiment NGO in 2007 to collect information on Russian veterans of Soviet and post-Soviet conflicts. In only five months of fighting, Russia has lost the same number of soldiers as the US did in more than 12 years in Iraq and about a third of the Soviet losses in Afghanistan during a nine-year occupation. Such very high casualty rates reflect a full-blown war between Ukraine and Russia rather than a small-scale insurgency or terrorist campaign. The UK lost 600 troops and police in Ulster over three decades during the Irish troubles. The ferocity of the Ukraine-Russian war has continued since the September 4 Minsk Accords that produced a tentative ceasefire. Hundreds of combatants and civilians have continued to die. In mid-November, a Russian missile battalion was destroyed by Ukrainian forces who claimed 150 Russian dead, including General Sergei Andreychenko, the highest-ranking reported casualty of the war. Russia’s losses from this battle are greater than the Ukrainian losses at Illovaysk in late August that forced Petro Poroshenko, Ukraine’s president, to the negotiating table. Chuck Hagel’s resignation as US defence secretary over weak US policy towards Russia is a portend of what to expect from a Republican-controlled Congress that – as in the 1980s over Afghanistan – supports hitting back at Russia by providing arms to US allies on the ground. Ukrainian envoys to the US are seeking weapons such as FGM-148 Javelin portable anti-tank missiles to use against Russian armour that has been building up during the ceasefire in the Donbas enclave. Senator John McCain increasingly resembles Congressman Charlie Wilson in the 1980s, who organised a massive crease in US covert assistance to the Afghan mujahideen. Vasilieva lives in exile in Ukraine because it has become dangerous to collect and publicise data on Russian casualties in an invasion that Vladimir Putin, Russia’s president, denies is taking place. Lev Shlosberg, a Russian lawyer, was beaten after attending funerals of 76th Airborne Regiment soldiers in Pskov who had been killed in battle in eastern Ukraine. Shlosberg had been interviewed by one of Russia’s last remaining independent television channels, Dozhd, whose journalists were also attacked. Although Russia’s denials of its invasion of eastern Ukraine increasingly resemble Soviet deception over its invasion of Afghanistan, there are two caveats. First, under Mikhail Gorbachev, Soviet leader in the latter stages of the war in Afghanistan, there was greater media freedom than in Putin’s Russia. Second, Putin cannot close off all channels and information about Russian casualties is available on the internet. Ukraine publishes the freest Russian-language media in the world and these publications are available online, at least to those who have internet access. Putin is hamstrung in achieving his objectives in eastern and southern Ukraine given the resolve of Ukrainian patriots to defend their territory, and rising opposition to the war in Russia. In September, 50,000 Russians marched in Moscow for peace in Ukraine. 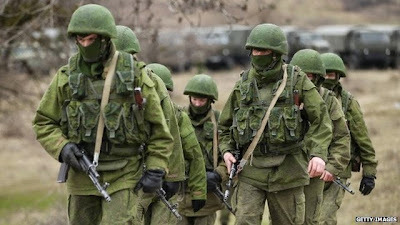 Russia’s respected independent Levada Centre issued a survey that found as many as 65 to 70 per cent of Russians oppose sending Russian troops to Ukraine. In the USSR and in today’s Russia, soldiers have caused themselves horrific injuries to avoid being sent to Afghanistan and the Donbas. Vasilieva recalled being told how one soldier thought up a way of breaking his own leg, and how another burned himself with ammonia. It is time to recognise the Donbas conflict, which has caused thousands of casualties, widespread destruction and over a million refugees, as Europe’s first inter-state war since 1945.